STACY FISHER is the founder of Living Upp, a lifestyle design company that offers unique planning & design tools for people who want to do life differently. Stacy is a registered dietitian and lifestyle coach with 19+ years of experience in the healthcare industry, where she’s worked with large companies such as Dell, Boeing and Nike. Stacy teaches high-achievers how to use an 8-dimensional framework to design a lifestyle that creates better health, more balance, and greater joy. STACY FISHER is the founder of Living Upp, a lifestyle redesign company that offers self-care planning & design tools for people who want to do life differently. Stacy is an author, speaker, and lifestyle coach with over 19 years of experience in the healthcare industry as a registered dietitian and certified diabetes educator, where she’s worked in private practice, in medical facilities, and with large companies such as Dell, Boeing, and Nike. In her book Uppward: A Self-Care System for Purposeful Living, she outlined 8 unique dimensions of self-care (systemic, emotive, luminescent, financial, cognitive, aptitudinal, relational, and environmental), which serve as the foundation for Living Upp’s products. 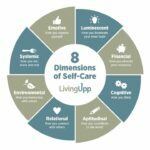 Stacy teaches high-achievers how to use an 8-dimensional framework to design a lifestyle that creates better health, more balance, and greater joy. Stacy has been a Registered Dietitian/Nutritionist since 2000. Registered Dietitian Nutritionists (RDNs) are food and nutrition experts who have met the following criteria to earn the RDN credential: 1) Completed a minimum of a Bachelor’s degree at a US regionally accredited university or college and course work accredited or approved by the Accreditation Council for Education in Nutrition and Dietetics (ACEND) of the Academy of Nutrition and Dietetics, 2) Completed an ACEND-accredited supervised practice program at a health-care facility, community agency, or a foodservice corporation or combined with undergraduate or graduate studies. Typically, a practice program will run six to 12 months in length, 3) Passed a national examination administered by the Commission on Dietetic Registration (CDR), and 4) Complete continuing professional educational requirements to maintain registration. Stacy has been a Certified Diabetes Educator since 2011. Certified Diabetes Educators (CDEs) under the National Certification Board for Diabetes Educators (NCBDE) must be a) A clinical psychologist, registered nurse, occupational therapist, optometrist, pharmacist, physical therapist, physician (M.D. or D.O. ), or podiatrist holding a current, active, unrestricted license from the United States or its territories; OR b) A dietitian or dietitian nutritionist holding active registration with the Commission on Dietetic Registration, physician assistant holding active registration with the National Commission on Certification of Physician Assistants, clinical exercise professional holding active certification with American College of Sports Medicine (ACSM) as a Certified Clinical Exercise Physiologist (ACSM CEP), previously known as ASCM Certified Clinical Exercise Specialist, clinical exercise professional holding active certification with the ACSM as a Registered Clinical Exercise Physiologist® (ACSM RCEP), health educator holding active certification as a Master Certified Health Education Specialist with the National Commission for Health Education Credentialing; OR c) A health professional with a master’s degree or higher in social work from a United States college or university accredited by a nationally recognized regional accrediting body. It also requires a minimum of 2 years of professional practice experience within a health-related field (as noted above) and a minimum of 1000 hours of diabetes self-management education (DSME) experience, along with a certification examination. In 2016, Stacy completed the Wellcoaches Certified Health and Wellness Coach certification program. Certified Health and Wellness Coaches must hold at least one of the following: 1) A Bachelor’s Degree or higher in a health related field, 2) A license, or license equivalent, in a health related field, 3) A Bachelor’s degree, or higher, in an area of study unrelated to health and wellness and a certification in a health related field, or 4) No degree and a certification in a health related field, with a minimum of 2,000 hours of work experience in the field. After completing either an 18-week online course, or a 4-day live course, students must pass a written exam, a practical skills assessment oral exam, complete a 2-day organization course, and submit practice client records. In 2016, Stacy completed the ACE Certified Health Coach certification. The ACE-Certified Health Coach requirements include the following: 1) must be at least 18 years of age, 2) must hold a current adult CPR and AED certificate including live skills check, 3) must hold either a current NCCA-accredited certification in fitness, nutrition, health care, wellness, human resources, or a related field; or hold an associate’s degree or higher from an accredited college or university in fitness, exercise science, nutrition, health care, wellness, human resources or a related field, or two years comparable work experience in any of these specified industries, and 4) pass a certification exam. Stacy completed the Level 1 Certificate of Training in Adult Weight Management in 2003 and later completed Level 2 in 2014. The Commission on Dietetic Registration’s Certificates of Training in Adult Weight Management are intensive programs that provide in-depth training related to the treatment of adult weight management, and include topics such as pathophysiology, dietary modifications, physical activity, pharmacotherapy, appetite regulation, intensive behavioral treatment, bariatric surgery implications and complications, relapse prevention, weight maintenance and counseling strategies.